In a bit of Friday weirdness, we came across a press release that we just had to share with you. It turns out that Anchor Communications has hit a major milestone: Its CEO has notched a Klout score of 68. Yes, that’s it…that’s the news. Agency chief TJ Kirgin has a score of 68. The St. Louis-based inbound marketing agency felt that it was worth touting that its leader ranked in the top 5 percent of influencers on the site, and proceeded to put together an announcement highlighting what a big deal he is. Klout hasn’t generated a list of his top influencers yet, nor has he been endorsed for any specific topic, but with a score like that, it’s probably only a matter of time. -Facebook: Comments, Wall Posts, and Likes. -Foursquare: To do’s and Tips. The score can fluctuate and is dependent on consistency and reaction. For instance, if a user tweets 100 times a day but gets no response, they are not effectively creating reactions and interactions, thus their influence and Klout score is minimal at best. 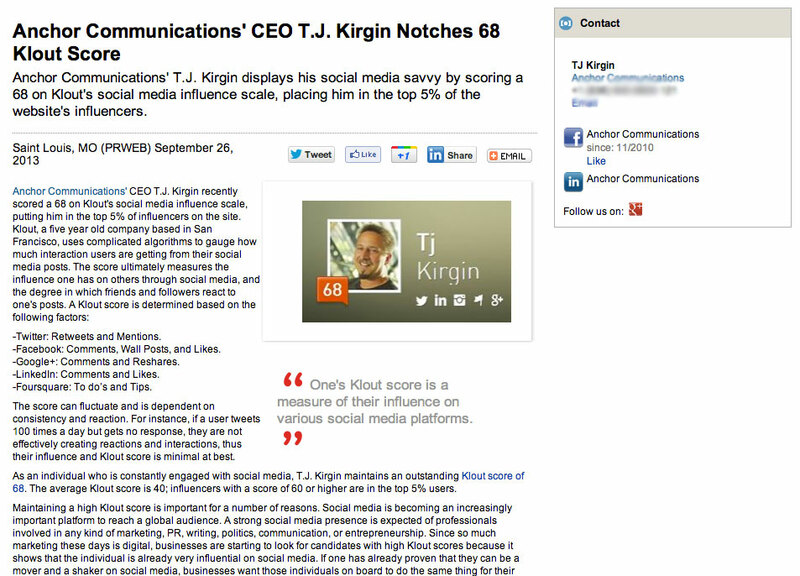 As an individual who is constantly engaged with social media, T.J. Kirgin maintains an outstanding Klout score of 68. The average Klout score is 40; influencers with a score of 60 or higher are in the top 5% users. Maintaining a high Klout score is important for a number of reasons. Social media is becoming an increasingly important platform to reach a global audience. A strong social media presence is expected of professionals involved in any kind of marketing, PR, writing, politics, communication, or entrepreneurship. Since so much marketing these days is digital, businesses are starting to look for candidates with high Klout scores because it shows that the individual is already very influential on social media. If one has already proven that they can be a mover and a shaker on social media, businesses want those individuals on board to do the same thing for their company. Klout also offers something called Klout Perks. If one’s Klout score is high enough, they become eligible to redeem perks. Once users are registered, they can earn Klout Perks based on their Klout score. Perks are exclusive products or experiences one can earn based on their score. Perks are given to users based on a variety of things, including location and influential topics. Perks enable brands and companies to connect with influencers in their area of expertise. Recognized influencers get first access to Perks that they can in turn share with their friends and social media audience. Brands and companies hope that if these influencers like the product or service they’ve been offered as a Perk, they will relay this to their audience and increase the exposure and reputation of said brand or company. With over 20 years of experience, Anchor Communications has transformed from a media buying and planning company into an inbound marketing focused agency. Located on Historic Main Street in downtown Saint Charles, MO, Anchor Communications strives to deliver the very best in inbound marketing and social media marketing by generating more visitors to a company’s site, converting those visitors into leads, nurturing those leads into customers, and then ultimately delighting them so they become lifelong advocates of the brand or company. Anchor Communications recognizes that there has been a dramatic shift in the consumer’s purchasing process and understands the concepts and methodologies required to meet the demands of this new age of consumerism. For more information on the importance of a Klout score, Anchor Communications, and the inbound marketing methodology, you can contact (636) 946-9800 or visit http://www.anchorstl.com. Of course, given that the agency is all about inbound marketing, having influence can certainly play to their advantage. But probably declaring that you do as a potential ploy to garner new business is a bit much, right? We’ve reached out to Anchor Communications for comment and will update this if we hear back.